Flop Turn River recently introduced an Open Face Chinese Poker gaming portal on its pages. Now, poker enthusiasts can enjoy the OFC and Pineapple OFC formats of this trendy poker variation that’s here to stay by visiting FlopTurnRiver.com or using their Facebook accounts. Play Open Face Chinese Poker Now! The OFC game, barely a few years old, has already attracted millions of fans worldwide as it offers exciting elements unseen in other types of poker. Since opponents can see each other’s cards, there is no bluffing, but the depth of the game’s strategic nuances and maneuvers more than compensate for this, making OFC a captivating, one-of-a-kind game. Even poker Hall of Famer, Barry Greenstein, recently tried Flop Turn River’s OFC portal when he defeated “agnesamurphy” by 35 points in a marathon game which lasted 28 rounds during a two hour match (https://www.flopturnriver.com/chinese-poker/table.php?395)! As the screenshot below demonstrates, the interface has a smooth look and feel and is very intuitive. Users have a variety of gaming options to choose from, including game type, number of players, time settings and number of rounds. The game screen is also equipped with a chat window for added convenience. FlopTurnRiver.com’s OFC portal can be accessed by clicking the game’s dedicated tab located on the website’s main page: https://www.flopturnriver.com. It is fully functional and allows forum members to start a game with their friends and/or invite other members to join in on the action. 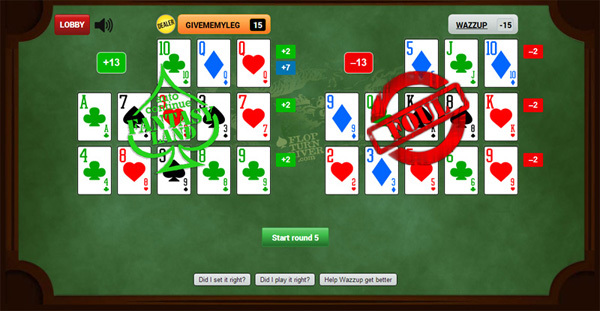 If no one is available to play or people simply prefer to practice their skills out of the public eye, visitors are welcome to challenge FTR’s computer-generated opponent, “Wazzup,” instead of taking on a live player. The OFC section of FlopTurnRiver.com comes complete with instructions about how to play, including a comprehensive and expertly written Rules and Strategy Ultimate Guide, a shorter How-To Infographic, Create Hand History feature and Discussion Forum. The interface is currently in beta-phase as the site is soliciting user feedback to make further improvements to its unique OFC portal. Flop Turn River is extremely proud to offer this new service and invites its existing and new members to enjoy the OFC experience as often as they like by visiting the following page: https://www.flopturnriver.com/chinese-poker/! If you are interested in learning more about the OFC offering on FlopTurnRiver.com, please contact Deborah Barlowe by phone or email. Her telephone number is: 704-996-6956. Her email address is: dbarlowe@flopturnriver.com.